Several languages from Sumatra, #Indonesia were originally written in the Batak script. This script was encoded in Unicode and the waiting was for a freely licensed font. Thanks to a grant by the Wikimedia Foundation, a project is under way that will produce a font for Batak and will transcribe sources from Dutch museums like the Tropenmuseum. For a script to be encoded into Unicode, a lot of research goes into describing the font and how it functions. For Batak you can find this documentation here. When you read this, you find details like how the combination of a consonant and a vowel is expressed in the Batak script. When smart algorithms are used only the valid combinations will be expressed. Given that multiple languages use the Batak script, the rules that are implemented in a font need to allow for every Batak language. 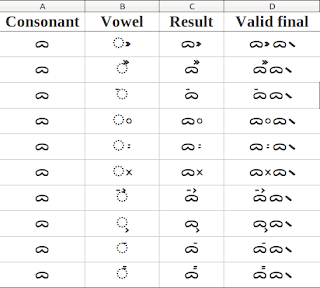 The first iterations of the Unicode font for Batak are being tested. When this is done, the font will be available and it will be possible to transcribe original Batak sources including a book on sorcery.